For all those who are waiting for when the new and latest enhanced version of Adobe flash version which is dubbed as Adobe Flash 10.2 version will be rolled out, here’s a great news for all you as you no longer have to wait for the same as we have the exclusive installation package of Adobe Flash 10.2 for their Android device. If you are exactly wondering about what is this Adobe Flash player new version and why this is being talked about then let me tell you that Adobe flash player basically is a light weight browser plugin packed with a rich internet application run time which delivers consistent and the engaging pure user experience which you can see on the screens in terms of either moving objects or even sometime sin the Videos and in other advertisements. Till now there was the version of 10.1.105.6 Flash version but now the latest version for the Android flash is direct 10.2 version which has numerous changes and advanced facilities which will further enhance the overall experience. Flash Player 10.2 is optimized for high performance on mobile screens and is designed to take advantage of native device capabilities—including a new video hardware acceleration model that enables dramatically enhanced video playback—enabling richer and more immersive user experiences. 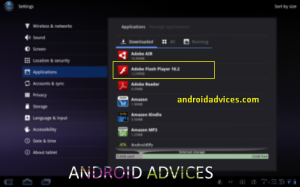 Though this Adobe Flash 10.2 version is officially slated to launch on March, 18, 2011 in the Android Market Place but since we managed to get the official Adobe’s Android Flash version 10.2, you can download and install this from here and can install the same. This version might not support the Android smart phones which are older than 2.1 versions. Also, the older version of Adobe Flash is pretty much laggy than this latest 10.2 version which is much more advanced and zippier than the earlier version. i just wnted to knw that why my samsung e7 is not supporting adobe flash player. I am unable to install the latest version of Adobe flash player. Kindly guide me on how to go about it. I am failing to have adobe flash player installed on my Samsung Galaxy s 5 . Kindly guide me on how to go about it. Can you tell me if Adobe can not be install in the Black berry? Because I need it. I recently bought a Odys Xelio tablet with icecream sandwich android 4.0.3. I am unable to watch any youtube videos. can u help me in this regard? yes there are some devices which are not compatible! I’ve got Samsung Galaxy Y 5360 with Gingerbread (2.3.6) and I’m trying to download this “version” of adobe flash player (10.3) or the 10.2, still I can’t find a download link: they all send you to Adobe Flash Player 11, that is not supported on my phone. Could you please help me? we will come out with the update very soon! i have a samsung galaxy apollo will this work with it? on google play flash player is not supported with my phone. i have msi pad enjoy 7 i cant play websites videos,and the skype video call is not working,pls can you give some advise,thank you sir…..
Can I install this on the zte score? If yes, how? Because i actually copy and pasted the file that you posted above to my sd card. Now I am at a loss at what to do. Would you kindly explain what I did wrong. it doesnt support the zte score device! can i install adobe in my samsung galaxy y-young phone? does samsung galaxy y-young support adobe? NO IT DOESNT SUPPORT ADOBE FLASH! it doesnt support flash directly! Hi… can you please help me out here. I have a samsung galaxy pro with 2.2.2 version of android installed. Im unable to view flash even in websites. moreover when i contacted the service centre they said that I will also not be able to upgrade my android version from 2.2 to 3.
on which phone you are trying to update the flash player! there is no way galaxy ACE will support flash, adobe only will update their flash player and reduce supported phones as update arrives there is no backward compatibility. So for Galaxy ACE user you must admit your phone lack of FLash support. The Truth Always Hurt. Nothing happenes… What do I have to do? hi neal i have upgrade my galaxy ace android froyoy 2.2 with gingerbread 2.3.5 but flash player is not working on it can u suggest anything how can i play flsh videos and games on my phone. as of now it doesnt support this phone! Samsung Galaxy Ace and similar ARMv6 phones do support Flash Player. There’s a special hacked version just for them. Go to the link below, download to your PC then copy across to your Android’s SD card, i.e. by USB. Although it does work the support can be buggy at best; I’ve found many times if you start zooming in or out when a Flash object is focused you have to reload the page to get it to work. Best thing to do is use Dolphin Browser HD, fullscreen it, then load the Flash object by clicking on the green down arrow, then hold on that for a few seconds and press the fullscreen button on that to make it fill the screen. Anything not requiring the use of a right click should work okay, but complex stuff like certain Flash games that are large in size will be slow. Does samsung galaxy y support flash player. can i play angry bird , farm ville etc. as of now it doesnt support flash! It doesn’t support flash as of now! Just upgrade my Galaxy ACE to Gingerbread 2.3.3 (officially via KIES). yes its still doesn’t support flash! yes its still doesn’t support flash!!! hey Neal! can we watch videos online in youtube? i wanted to buy a galaxy ace! some says it supports flash player and some says it does not! which is true? is GALAXY ACE a perfect and a smart phone? ACE DOESN’T SUPPORT FLASH AS OF NOW! flash enables the moving content in your phone, there is no disadvantage of the flash player! yes, as of now it doesn’t support flash! Does the samsung admire running 2.3.4 gingerbread support flash? hi, will samsung galaxy ace support flash and divx files after rooting it? no, it wont be supporting as of now! b\no, it doesnt support flash as of now! guyz can anybody tell me if i can play flash games on my samsung galaxy ace, i really love to play games so is there any other site from wer i can play or any app??? am tired of playing games from android market. any kind of help will very much appreciated thank you. i cant access online mp3 songs on my galaxy ace, if am trying to play songs it says upgrade flash player. Which site you are visiting? Neal, r u suggesting me games or not?? Samsung Galaxy Ace S5830. hey gaurav, you can download games from the Android Market Place! it is very nice shooter game with upgrades and other stuff. check with the operator as its a data speed issue! I’m looking for 3d first person shooting game… Or any game like IGI or Counter Strike. Ok Neal… Now could u pls suggest me some best free games for galaxy ace S5830. Because I can’t find good games in the android market. which games you are looking for!? Hey Neal thanx!… And I want to know that how could I watch live tv without 3g on my galaxy ace? contact your operator for the same! Hi Neal… I’ve Samsung Galaxy Ace S5830. When I try to download any game from android market, it downloads but doesn’t install. It disappears from my notification bar in mobile without any notice or error message. Please let me know how can I fix this problem. have you cleared the cache and are you facing this on all the phones? i got my galaxy tab 10.1 but i got a problem with the flash player plugin for web borwser. im install adobe flash player v10.3 already but seem nothing change because i still cant open any website that needed flash player plugin. im trying uninstall n reinstall but still the same. please help! which version of firmware you are on? For All Those Galaxy – ACE Users. I read a lot and found this stuff bout the Qualcomm’s 800MHz MSM7x27™ mobile processor. So God said Read Human ! When i try to install the Adobe flash player in my sony ericson X10 mini pro (using android 2.1 ) by app installer . i get some error like : THERE IS A PROBLEM PARSING THE PACKAGE . Please Kindly help me to sort out the issue . auch ich habe ein galaxy ace und software 2.3.3 aufgespielt. wie kann ich ein flash player laden und welchen? alles was ich probiert habe geht nicht. wann und wie ist dies möglich??? are you using the dynamic or static IP? Check with your service provider! for which mobile you want info on? as of now it doesnt support but as soon as it supports we will come up with the same! Despite that the Galaxy Mini runs the Flash-capable Android Froyo, there is no Flash support in the web browser. The situation is quite similar with that of the Galaxy Ace, the Galaxy 551, and the LG Optimus One – the phone’s processor doesn’t support the Adobe Flash plugin. Is samsung galaxy fit never support adobe flash player?? IT WILL BUT IT WILL TAKE SOME TIME ! thanks shivam you can also try 10.3 version!! Yesterday I confirmed from samsung service centre about installation of flash player on my samsung galaxy pro but they refused that there is no way to install flash player on it . So i got sad to listen this. Pls tell me one thing that is there any software on which I can play online indian tv on it because i had tries so many softwares for this like akilwap,zenga tv etc. but there is always problem and show a messeage this video can not be played. as of now there is no tweak for installing the flash player but as soon as it arrives, we will surely come up with an article! is there any flash player that would give the same experiance as adobe? 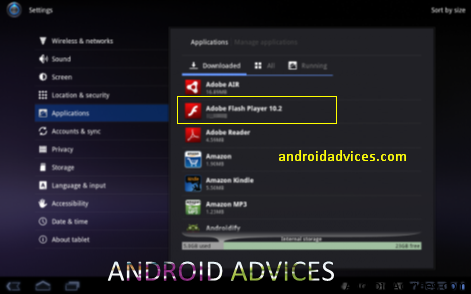 when will adobe flash player for samsung galaxy ace will be realeased? no, as of now its not there but as soon as it becomes available we will soon update you! there is no ETA as of now but as soon as it arrives we will surely update you! mine is rooted galaxy ace 2.3.4 and i installed flash player 10.1. I tried and already confirm that i could watch videos from youtube. does it mean that my ace now support flash?could i use flash 10.2 or 10.3 for better viewing? no flash is different from the videos! Have tried 10.1, 10.2 and 10.3 all say the same ‘NOT INSTALLED’ frustrating to say the least. Samsung Galaxy Apollo running Froyo 2.2 Also rooted but I have tried unrooted too, I needed it to run TV Shows Stream app which relies on Flash player and also won’t install without it. Flash is not supported as of now on this phone. any error which is popping up? I tried flash players on my galaxy pro but it does not work.pls help me. Because mainly I bout this phone for flash player. hey neal hi…!! i just want to know that ……..does galaxy pro supports flash player because when ever i used to install it ………after installation it says…. any error its giving after updating with this version of flash? Have you tried 10.3 Flash version? i have a samsung galaxy tab, tried to instal flash player, but it would not. could you help to guide me how to do it? kindly follow the instructions which are mentioned above! as of now it doesnt support Galaxy Fit! SO WHAT IS THE FINAL VERDICT ON SAMSUNG GALAXY ACE ? SHOULD WE BUY IT OR LEAVE IT COZ OF THIS ABSENCE ? IS THERE ANY HOPE OF DEVELOPMENT IN FUTURE ? if you can wait then you can get better phones and if you want right now, then you can go for HTC Wildfire S! when i try to run the .apk file … getting parser error.. samsung galaxy ace. have you tried 10.3 Flash version and on which version you are on? Hi can anybody suggest as how to download Adobe flash player plugin for Samsung Glaxy S2 Android operating system mobile. Adobe flash player is already downloaded. Actually I want to play video email and when I contacted Talk Fusion for help they replied download adobe flash player plugin. I am not aware from where to download this plungin? have follow all your thread about samsung glaxy ace and have concluded that samsung ace don’t support adobe flash player…. But if i installed google chrome in that andriod which has by default adobe flash players…will i be able to run youtube videos and online games with that…. Looking for your prompt response…. hey tara, really appreciate your feedback and is a true feedback! I have samsung galaxy ace, after installation of adobe flash player on device. its not working, can someone tell me any solution for it. And secondly can someone tell me whether samsung galaxy ace supports java. as of now ace is not supporting the flash! Damn,problems with galaxy pro…sign me up for the list of people having problems. Just to let everyone know I have spoken to people at Samsung and they have informed me that the Galaxy ace does not support Flash so it pointless asking as clearly does not know or is messing people around. no it doesn’t support as of now! have you tried installing the 10.3 version? It should be compatible! help required following removal of pre installed apps from samsung s2. phone rooted. now unable to receive apps from web. you will have to root your phone to remove the system apps! It’s an excellent article and I completely agree with that which you stated. I am trying to setup the actual Feed but I ‘m definitely not very pc literate. Might someone tell me exactly how let me setup the actual RSS feed and so i get informed of any new article? You have to clarify it in an simple method as I am obtaining aged. neal, just wanna ask. u mean we can install flash player in samsung galaxy ace if we upgrade it to gingerbread? is the requirement spec for flash to work in mobiles is not the same for froyo and gingerbread? because as far as i know, all gingerbread phones should support flash. correct me if i’m wrong. P/S: I also seen a youtube vid regarding ace in gingerbread. the most obvious change i can see is the recording resolution is enhanced from QVGA to 640p. (if I’m not mistaken). Unlucky, the video didn’t show that ace supporting flash in gingerbread. Can you confirm this? hey! some of the devices are unable to install flash as of now die to unknown reasons! we are working on the same and will soon come out with a resolution! Stay Tuned! hey saurabh there are some issues with some firmware versions, it will be fixed in the next update, which version you are on? Did upgrade my ace to gingerbread and able to install flash 10.2/10.3, but as informed always, Ace does not support FLASH. hey Neal so finally can we install a flash player on samsung galaxy ace ?. @swaroop you can try the same by downloading from marketplace! Patch still hasnt come, any idea wen samsung will release it? @mudt will be difficult to pin point the date but soon it will release! @fabian @derek kindly don’t use abusive language in this site! kindly give us complete details that is on which phone you are on along with the current firmware! How do I install this on galaxy ace? I downloaded this APK file, and what should I do next? It doesn’t open. I’m sorry I accidently posted another one…. How do I install this in galaxy ace? I downloaded this APK file but it does not open. I tried 10.1, 10.2, 10.3, but nothing worked…..
most of people like to buy adobe flash player supported phone, but let me inform u all phone lover that some phones support adobe flash player like nokia symbian 60 third and fifth series phones support adobe flash player 3.0 and latest is 4.0 on nokia latest hand set like n8, e7 and so on. But in android phone Motorola defy support adobe flash 3 and where as Motorola droid pro supports flash10.1. So many android phones still have to work on installation of flash in there lower budget phones, thus i can say its a company stratigy to do sutch type of monopoly in android market. @fabian which phone you are using? Hi neal. I followed your instructions to instal 10.3 on my galaxy ace but when I try to run the apk file out says parse error unable to parse file. Why is this still not working ? I had exactly the same response from my samsung galaxy pro after downloading flash 10.3 straight to my phone from the link on this site. What is parse anyway? Any ideas what to do next? hi neel can i install this flash player in my samsung galaxy ace ???? @ashish yes you can install flash player! What about. My touch 3g? Update from the above link! Anyone pls suggest a android phone which supports flash. i am planning to buy around 10-12k. @Mahesh I would suggest you to go for LG Optimus One in that budget! LG optimus one does not have flash support too…..Its having same problem as samsung Ace …some h/w incompatibility…….. Still cant get flash player to install on my Ace, are you sure it works on the Ace? No no no… Ace can’t support flash because of hardware limitations i.e. type of processor……. Hi, I just upgraded my Samsung i-5800 Galaxy Apollo from 2.1 to 2.2 Froyo. I was able to download the apk file from your website to my device’s sd card but when I tried to install it, I got a message saying “Application not installed”. I tried it several times and got the same thing. Help, any advice would be most appreciated. How did you install 2.2 on your Apollo???? I’ve been trying for a long time, but Kies is not offering any updates…did you root your phone? once i’ve installed the Kies on my computer, I connected my 1-5800 with the provided usb cable. you need to unmount your sd card first before connecting the cable, otherwise Kies does not recognize the device. Once the device connects, a message will say that a newer version of the firmware is available for download. Follow the screen instructions. Goodluck!! Hi Neil,great your comments are really helpful but wat is the final thing abt flash plyr in Ace.I m confused wid buyng ace bcoz of this flash player thing.How is the internet in ace.Can I do everything wid the internet in ace.What r its limitations?Pl reply soon.thank u.
hey @ronnie wat’s your budget so that we can recommend you a phone! Neil,I wrote it…….my choice is galaxy ace.Cofused wid the flash player in ACE. And in ACE what type of things that r not supported in ACE. Can it b used as modem? @Ronnie it acts as a Modem! Hope we could do something for our Samsung Galaxy Ace to support Flash content.. I Have seen Android2.3 gingerbread already installed on an Ace.. I just hope Flash support will follow suit.. Lets just hope for it guys..
And also that, Did the ACE which have been seemed as live video coverage of ‘live cricket matches’ and other live programmes? If would be seen yes or no ? Which browser is the best(fast) in that ACE ? Is it supports mozila firefox? @jerish yes it supports mozilla! just installed to my Ace, get the same problem says not installed, will a fix be soon? And also recently april 23 that the galaxy ace is updated with gingerbread 2.3 aaah !! @jerish we have updated with the article! you can update your Ace with 2.3.3 release! What do you mean by this? update Ace with 2.3.3 release?which article is updated?I am really following this thread every now and then to check up on new updates for the flash for ACE. Thanks. Ill wait for your response neal. I want to know whats the correct information . Does GALAXY ACE supports FLASH PLAYER and AIR? And tell them that the main disadvantages and advantages of Samsung galaxy ace? Yes @jerish galaxy ace supports flash. hey @jerish you can get a full detailed hands on experience from this site! They have also done a Video review which is trusted and also is very real too. hey @paul there’s a surprise coming soon for all Galaxy Ace users, so stay tuned for it! Please can you send me step by step instructions to down load flash 10 for my samsung galxy ace. My operating system is 2.2.1 if i ned to upgrade that please could you send me the instructions for that too. Hi, I have the Samsung Galaxy Pro (Half touch screen, half qwerty!) Would like to download Flash Player but have same problem – can’t find it in the Android market and Adobe says the phone isn’t supported (though it has Android 2.2 froyo). I have downloaded the apk file but when i try to open it, there’s nothing on my ‘pooter that will allow it to open so I can’t put in the password as you suggest. Can you help? @davellani as of now its not supported, after a small patch update which will be sent soon from samsung you will be able to load flash! Another one of those “We are Samsung, we will make you wait” bullshits – please do yourself a favor and go to this page – – this version works perfectly on Samsung Galaxy Pro – I am running it on mine peacefully :). HI, where is this link, some know about update to galaxy pro B7510??? Thanks !!! @uriel may i know in which phone you are trying to install? @uriel just download in your computer, unzip with the password and get the apk, and copy this apk in your phone to open the same n install! @NISHANT wat’s your handset model ? i got ace too. and as i know samsung galaxy ace didnt support flash player no matter what u did. i know someone who expert in smartphones industries and he said galaxy ace build without supporting flash player so it almost imposibble to have flash player. but if one of you already knew or solve this problem pls share with me. i want flash player too. Thank You Neal. I am going to be patient in waiting for the next instructions. I keep myself posted everyday. sorry if its double posting, my browser restarted. Basically I think all Ace users are facing the same problem. the only time we can watch flash is using the browser Skyfire, and I was told it converts the flash vids into mp4 files for us to view it ala Youtube players on the iphone…. we cant install it even if we downloaded it. Same problem as Max/Kevin. I have Galaxy Ace/Froyo and I’m unable to install flash player. Not able to find it on the Market either. Can someone help?! Yes, the only way for me to install it is to download from PC and then transfer to my phone. However if I search in the APp Market i cant find it…. Hi, I downloaded the file since you have mentioned it can be installed in samsung galaxy ace. I unzipped the file and got honeycomb install flash player 10.2 and tried to install.but when I clicked on install it says after loading that it wasn’t installed.I opened the installer in “my files” icon or a file manager application then I opened the installer. I already allowed installation from other source.Can you help me?so I can have a flash player on my phone.Samsung Galaxy Ace.Thanks. Hi guys, I just got my Galaxy Ace with froyo on it, I downloaded this and tried to install it using AppInstaller. It was installing and then said Application not installed, pls help me. I wanted to play some Swf games on my Ace. @max you can copy the apk and then install the same in your phone! hye.. can this be using for samsung galaxy ace? if it doesn’t work.. where can i find an adobe flash player for samsung galaxy ace..
@affrizal yes you can install for ace! I am having problems loading the apk file. I keep getting a message which reads “There is a problem parsing the package?” Any advice? Thank you for your help. @umer do spread the word among your friends so that they too can experience the latest flash and thanks for appreciation. I cant also have the same problem. My samsung galaxy fit S5670 does not support flash player. Just give us 5 minutes, we will be fixing the issue in the next 5 minutes. @umer the link has been successfully refreshed, try now it will be working fine. Do let us know if we can help you out with more queries. Stay tuned to Androidadvices.com. Hi there Neil, thanks man for the update BUT it is not a .apk file ,,i downloaded it on my pc and then transfered it to SD card but could not install it as mobile was unable to read the file format. Can you just guide me through the installation process on Samsung Galaxy S, which I have upgraded to 2.3.2 gingerbread version from your site only. hey umer sorry for inconvenience but you need to first unzip it, add the password and then you will get the apk file and put this apk file in your android device, directly it won’t run as its a zip file in which the apk file is located. i just have purchased samsung ace and tried to run flash player 10.2 and 10.3, but while installing its saying application not installed. pls suggest me how can i install that application (flash player). as of now its not supported by yuor phone but as soon as the support arrives, we will surely come up with an article!